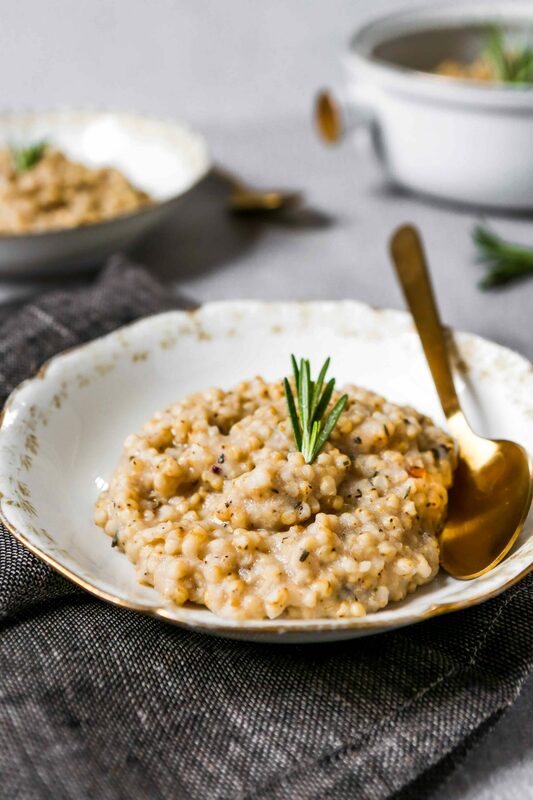 Sorghum risotto is a unique take on the classic Northern Italian dish. 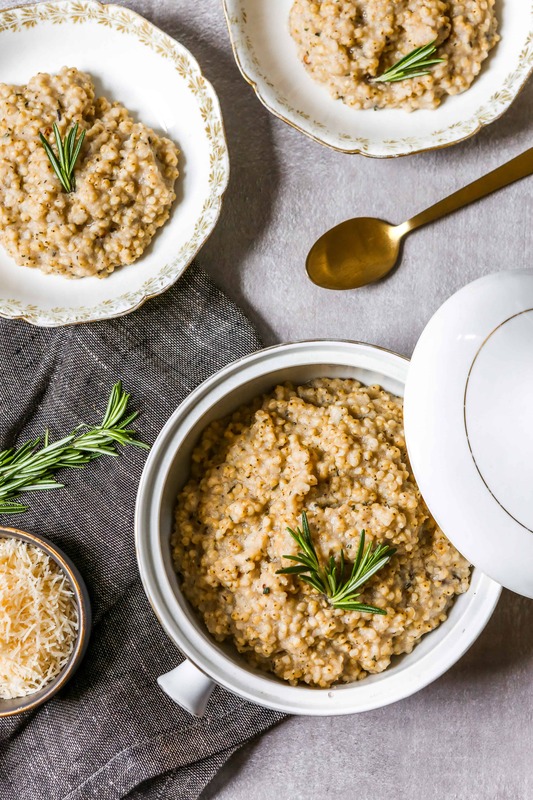 Traditionally made with starchy rice, this recipe will teach you how to use sorghum in place of rice and how to best cook it to create the characteristic thick, creamy consistency. Before we get into the details of making sorghum risotto, we need to first understand what risotto is in a traditional sense. So what is risotto anyway? Risotto is a rice-based dish hailing from the Northern region of Italy. It’s made mostly of starchy short-grain rice, broth, wine, and a handful of Parmesan. Risotto is warm, creamy, and satisfying. What do you need to make risotto? Low-sodium broth such as chicken, seafood, beef, or vegetable. I always recommend cooking with low-sodium broth and stock so you can control how much seasoning is added, especially with a dish like risotto, which uses a lot of broth. Nutmeg may be a surprise, but a few grates of fresh nutmeg is a great way to boost the flavor of any creamy dish. The process is simple. You start by sautéing rice in a little bit of butter, and often onions or shallots. Once the rice grains start to look translucent, incrementally add hot broth to the pot. Each addition of broth needs to be fully absorbed by the rice before the next addition of broth can be stirred in. Traditionally, the rice mixture needs to be stirred often, and sometimes constantly. But thanks to many recipe tests and the brains of test cooks at America’s Test Kitchen, the process has gotten much easier. Ok, traditional risotto sounds pretty delicious, does it not? So why on earth would we want to make risotto with sorghum, and not rice? Whole-grain sorghum (which is also gluten-free) contains more protein and fiber than rice and is higher in just about every other nutrient. It’s a worthwhile swap if you’re looking to try something different or to bump up the nutrition of this dish. Oh, and if you aren’t looking to be buddy up with the Italians. I’ll be honest, this isn’t a 30-minute dinner. Sorghum risotto takes a little longer to cook than traditional rice-based risotto. The bright side? Much of the cooking process is hands-off. It’s not so hands-off that you can leave the house, but it’s pretty hands off. In general, sorghum takes longer to cook than rice. And in this case, it requires some simmering time in between the additions of liquid. Hence the hands-off cooking aforementioned. 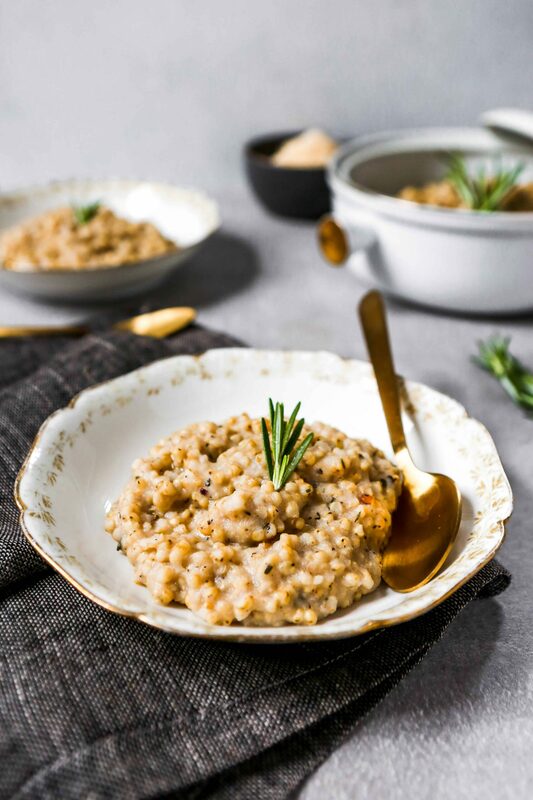 Sorghum also requires more liquid, which is why you’ll notice that this risotto recipe uses a mixture of broth and water. During the testing of this recipe, I found using all broth created an overly-salty, leave-a-weird-flavor-in-your-mouth affect which was easily avoided by diluting the broth with some water. Easy peasy. And cheaper. So hey, win-win! 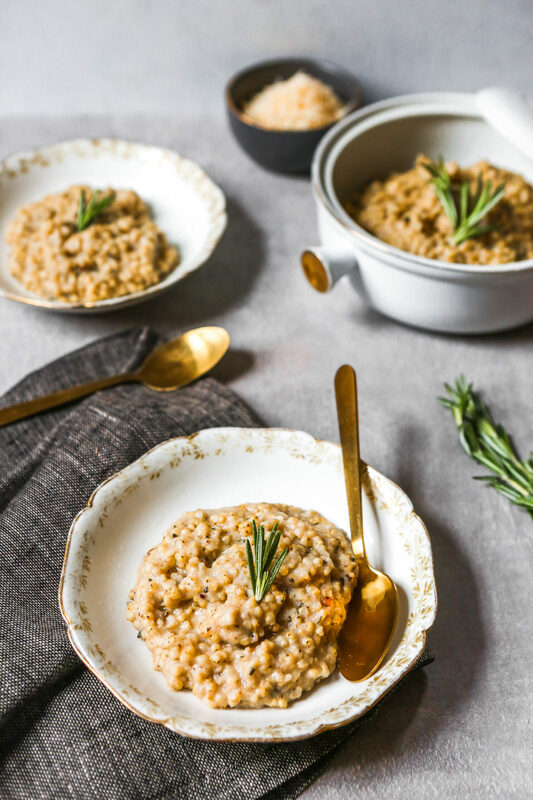 I like to finish this risotto with a tablespoon or so of earthy rosemary—it pairs well with the sorghum, Parmesan, and wine. However, any hearty herb like sage or thyme would work just as well. 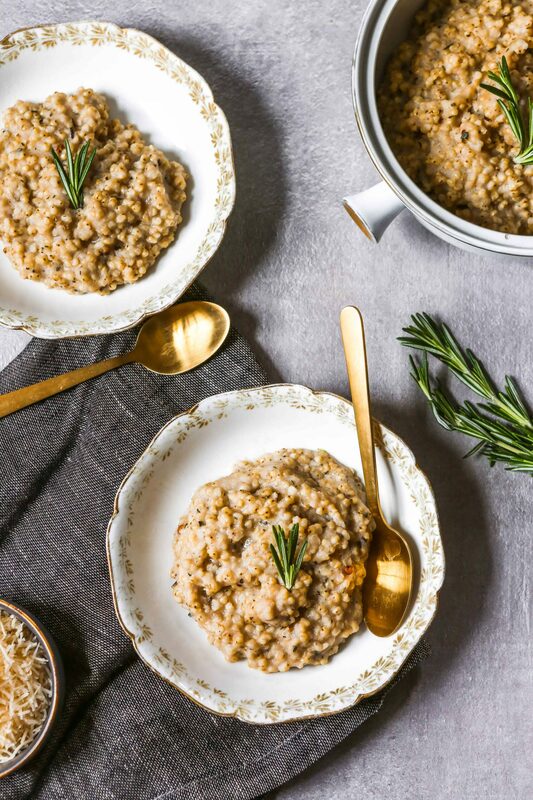 Sorghum risotto is a unique take on the classic Italian dish. 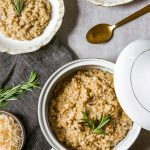 This recipe will teach you how to use whole-grain (and gluten-free) sorghum in place of rice and how to best cook it to create the characteristic thick, creamy consistency. Serve with a piece of grilled fish, roasted chicken, or a braised meat. Combine broth and water in a saucepan, bring to a simmer over medium heat, covered, then reduce to medium-low and maintain a simmer. Heat butter in a Dutch oven or stock pot over medium. Add shallot and cook until softened and translucent, 3 minutes. Add sorghum, and cook, stirring constantly, until edges start to become translucent, 3–4 minutes. Stir 1 cup warm broth mixture into sorghum, and cook, stirring constantly until liquid has nearly absorbed, 15 minutes. Stir in 1½ cups warm broth mixture, reduce heat to medium-low, cover, and simmer 15 minutes, stirring once. Uncover pot and cook, stirring constantly 1 minute, then stir in another 1½ cups broth mixture; cover and simmer 15 minutes, stirring once. Repeat process of adding broth, simmering, and stirring until all broth mixture has been used and sorghum is tender and creamy, about 45 minutes more. Stir wine into risotto and cook, stirring constantly, until creamy, about 4 minutes. Stir in Parmesan and rosemary; season with salt, pepper, nutmeg and additional rosemary, if desired. To make this vegan: use vegetable broth instead of chicken, use olive oil or vegan butter instead of the butter, and leave out the Parmesan. Make ahead tip: this risotto can be made up to 2 days in advance. Just transfer the cooked risotto to a container with a tight-fitting lid and refrigerate. To reheat, transfer chilled risotto to a pot over medium heat. Add ½–1 cup broth and cook, stirring frequently, until heated through.